"Fund Raising is a team effort." "To find donors, best to have all three: Connection, Capability and Concern." 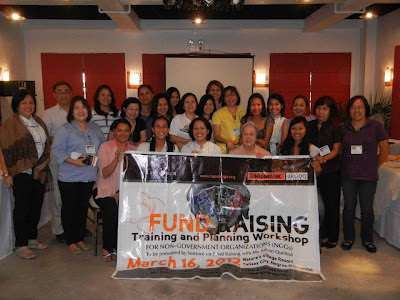 These are just a few of the many things learned during the Fund Raising Training and Planning Workshop of Tapulanga Foundation, Inc. held last March 16, 2012 at Nature's Village Resort, Talisay City, Negros Occidental. Presented by the guru of fund raisers, Ms. Marianne "Mayan" Quebral of Venture for Fund Raising, 30 participants (either a Board member, Executive Director and/or staff) from fourteen organizations enthusiastically joined in the workshop. It was very excellent. We got more than we expected in terms of knowledge. More power and God bless you. Keep it up! Very informative and useful especially that we are now in the process of re- organizing structures. A very productive day for me. Thank you very much. Excellent speaker, very accommodating and helpful to needs of the audience. Audience size is enough for learning. It was very good - we gained so much from the workshop. It was a very helpful training workshop. Another fund raising seminar, please. A BIG thanks to the major sponsors: Akubo Software, Inc. and Union Bank of the Philippines and the minor sponsors: Nature's Village Resort and Mayor David Lacson of E.B. Magalona.